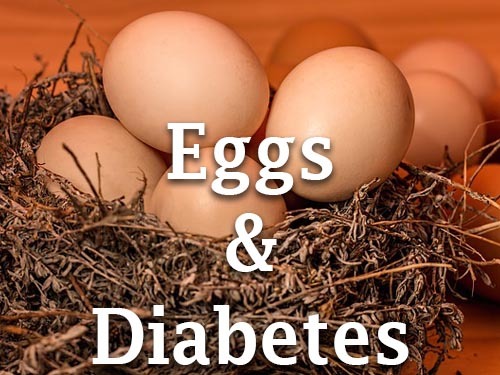 You are here: Home / Foods / Are Eggs Good or Bad for Diabetes? Have you ever tried a farm-fresh free range egg from a happy chicken? Never mind how to determine if a chicken is happy, the point is that these eggs are quite different from store-bought eggs. If they are free-range eggs, it is likely that the shells are a bit more fragile than from caged hens because the free-range hens are feeding on bugs, seeds, mash and corn without additives such as extra calcium and arsenic….the eggs may be brown and bumpy, but what about the nutritional differences between free-range and caged eggs? Are there any real differences? And, are eggs a healthy addition to your diet or not? Finally, can people with diabetes eat eggs? Will the eggs help or hurt people with diabetes? First things first—what are the nutritional benefits of eggs? One jumbo egg contains, on average, 90 calories, with about 56 calories from fat—10% of which is saturated fat. Eggs also contain cholesterol (266mg)—but no carbohydrate and no sugar! Eggs are a great source of high quality and complete protein, almost 8 grams, containing all the essential and non-essential amino acid building blocks of protein. Eggs also have both omega-3 and omega-6 essential fatty acids, Vitamin A, D and some B vitamins. That same jumbo egg also contains minerals such as calcium, iron, selenium, sodium and phosphorus. Are There Nutritional Differences Between Free-Range and Caged Eggs? One recent study from Rutgers University has looked at the difference between free-range and caged eggs—that study found that free-range eggs are higher in vitamins and minerals and lower in cholesterol as compared to caged eggs. They also found that the meat from free-range chickens had less fat and tended to be tougher and stringier than caged birds. Other studies have found similar levels. Overall, free-range birds tend to be healthier and you can be more certain that they do not contain antibiotics or pesticides. For many years, people were told to avoid eggs, or to only eat egg whites. There were concerns about the levels of cholesterol in egg yolks. However, that relationship to ingested cholesterol and high blood levels of cholesterol was never really very clear, even though it may have sounded that the science was definite. It is notoriously difficult to do science on nutrition quite simply because scientists can’t ethically actually control what people eat—and if they rely on people to answer questionnaires on what they eat, well, that may not be all that reliable either. A recent article at the (mostly) political blog site fivethirthyeight.com examined why nutritional research is problematic. They found odd correlations—including eating egg rolls is correlated with dog ownership and that having an “innie” bellybutton was correlated with eating cabbage. Obviously, those correlations are meaningless, but they point to some of the difficulties of doing research in the nutritional field—there are just too many variables to know exactly what any individual should eat for optimal health. We are then left with “odds” and “probabilities” that, for most, will be good, rational advice but won’t necessarily work for everybody. That means that you get to make your own choices. The best sorts of studies to help you make these choices are the scientific meta-analyses. These are studies that examine previous studies—they pool all the data and then re-analyze the information. This tends to minimize any errors and more closely approach “provable” information. One such meta-analysis looked at eggs and the relationship of eggs on the diet to heart disease and diabetes. These researchers looked at 16 studies and over 90,000 individuals with and without diabetes. Some people were followed for up to 20 years. This large study found that, for healthy people, eating on average of 1 egg per day was not associated with an increased risk of heart disease, stroke or diabetes but that for those with diabetes, eating more than 1 egg per day was associated with a somewhat higher risk of heart disease. On the other hand, another study indicated that the risk of T2D was decreased by eating more than 1 egg per day, supporting the findings of yet another study published in the journal Diabetes Care. Conflicting results are always good for another clinical trial—two more recent studies concluded that including eggs in the diet of diabetic patients did not result in any increased risk of heart disease,  and that that the differences found in earlier studies may have had more to do with individual risk of heart disease than with the general nutritional benefits of eggs. In other words, the earlier studies included diabetic patients who were already at risk for heart disease and did not take that into account in the results. The bottom line appears to be—if you have diabetes AND are at greater risk for heart disease (eg. Family history, high cholesterol levels, high homocysteine levels etc), moderate the amount of eggs you eat, perhaps limiting the eggs to 2-4 per week. If you have diabetes but are not at a higher risk of heart disease (eg. No family history, normal cholesterol levels, normal homocysteine levels etc) you can likely enjoy 1 egg per day without worry. Recently, there has been a lot of internet information regarding quail eggs and diabetes. There is no scientific research backing claims that quail eggs are somehow “special” for people with diabetes—there IS, however, clear evidence that quail eggs have significantly less cholesterol (76 mg in 1 egg as opposed to 266 mg in a jumbo egg) than eggs from hens and are great sources of protein. However, quail eggs are small (9 g versus a hen’s egg with is about 63g), so on a per gram basis, quail eggs actually have more cholesterol—about twice as much. Now you know how eggs effect your diabetes diet. Brower, Sunny, et al. “Taste and Nutritional Differences of Non-Factory Farmed vs. Factory Farmed Eggs and Poultry.” (2013). Is the only way to know how much carbs I am allowed in a day through my Dr or a dietitian?